1. Set aside one third of the strawberries. Heat the remaining strawberries in a large saucepan with the icing sugar and lemon juice. Simmer gently for 20 minutes until the fruit has softened. Blend to a purée and set aside. 2. Layer 1 tbsp of the broken shortbread, then 1 tbsp of the fresh strawberries into the bottoms of 8 sundae glasses. Next, add one scoop of vanilla ice cream, followed by one scoop of strawberry ice cream. Repeat the layers of biscuits and fruit, finishing with an extra scoop of vanilla ice cream. 3. 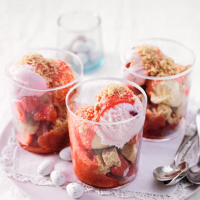 To serve, divide the strawberry purée between the sundaes and top with a scattering of shortbread crumbs.